TV show dates: October 14, 2018 — present. Performers include: Melonie Diaz, Sarah Jeffery, Madeleine Mantock, Ser’Darius Blai, Ellen Tamaki, Charlie Gillespie, Rupert Evans, and Valerie Cruz. 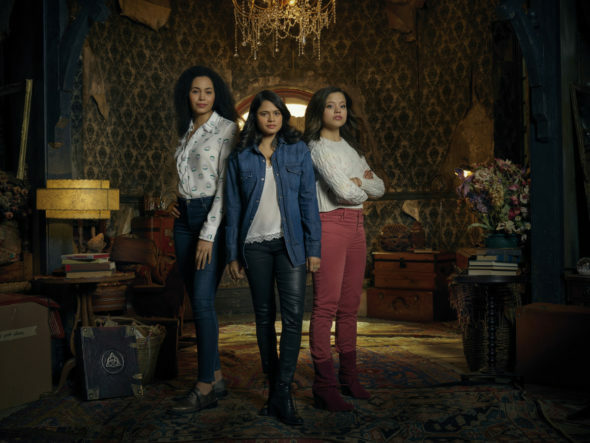 Based on The WB’s series which ran from 1998 to 2006, the Charmed TV show is a supernatural fantasy drama centering on the Vera sisters –Melanie (Diaz) and Maggie (Jeffery) — whose mother, Marisol (Cruz), dies in what at first appears to be a tragic accident. Three months after losing their mom, Mel and Maggie discover they have an older sister, Macy (Mantock), whose existence their mother had kept a secret. Following in her mother’s footsteps, Mel is a woman’s studies grad student at Hilltowne University. On the other hand, Maggie is a freshman who is considering joining a sorority and has a off-and-on relationship with Brian (Gillespie). Meanwhile, Macy is an accomplished geneticist. Macy wants to connect with her sisters, but Mel, who has been unable to accept the official explanation of Marisol’s death, just can deal with this surprise and shuts her out. With their emotions heightened, all three sisters start exhibiting new abilities. While Mel realizes she can freeze time, Maggie can read people’s thoughts, and Macy starts exhibiting telekinesis. Harry Greenwood (Evans), who they thought was taking over Marisol’s department at Hilltowne, tells the sisters that there is a good explanation for their new powers. In actuality though, Harry is a “Whitelighter,” ie a witch’s guide. When the women learn their mother’s death was not an accident, Mel feels somewhat vindicated. It turns out their Marisol was murdered by mysterious dark forces. Now these young women have to accept their destiny as “The Charmed Ones” and devote themselves to protecting humanity from the demons that prowl the earth. As they learn to harness the “Power of Three,” the sisters realize they are stronger together — even though they’re up against the unknown evil which killed their mom. What do you think? Do you like the Charmed TV series? Should this TV show be cancelled or renewed for another season on The CW? More about: Charmed (2018), Charmed (2018): canceled or renewed?, Charmed (2018): ratings, The CW TV shows: canceled or renewed? I love Charmed!! I watched the first Charmed years ago and thought it was great. I think the new series fits right in with everything else on the CW too. The sisters make me want to know what’s gonna happen next. Please renew! I was very disappointed to see how much has been changed. Im a die hard original Charmed TV series. I like many others thought you should have picked up the story line with their children and guest star piper, pheobe etc. Unfortunately after seeing the initial airing of the new charmed I was so disappointed I’ll stick with my reruns of the originals till someone on the writers get with it. Blah! I think I would like this better if the actors were able to actually act! I gave it a shot and I hope it gets the axe. I wasn’t a super fan of the original Charmed but it was better than this trash. I absolutely love this reboot! Gets better every episode. I’m excited to see where it goes. Thank you for creating this fun new take on Charmed.